Please note that the content of this book primarily consists of articles available from Wikipedia or other free sources online. Peper Harow is a tiny village in south-west Surrey close to the town of Godalming. The whole village is privately owned and access is restricted. 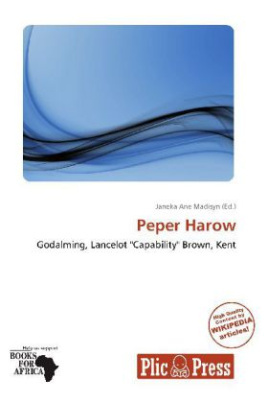 The name "Peper Harow" is very unusual and comes from Old English Pipers Hearg meaning, approximately "Pagan Temple". Peper Harrow appears in Domesday Book of 1086 as Pipereherge. It was held by Girard (Gerard) from Walter, son of Othere. Its domesday assets were: 3 hides. It had 3 ploughs, 1 mill worth 15s, 7 acres (28,000 m2) of meadow. It rendered Pds. 5.